In the Egyptian tradition the meaning of the word Shenu is also known as the more modern word Cartouche (French). A cartouche or Shenu is a symbol of eternity and an infinite cycle. It is the round or oval line of light that in Egyptian art, holds and protects the names of royalty or sacred figures. The Shenu can be seen as a mandala that supports and protects the holy centre. It is the keeper of the entire Cosmos and its possibilities. In this Shenu, the centre is an oval form representing the “Cosmic Egg” or life principle, that is the symbol for all creation. In the Egyptian tradition the Sun-god Ra was born out of this Cosmic Egg”. The Egg is the keeper of the essence of the soul and it is surrounded by the leaves of the lotus flower. 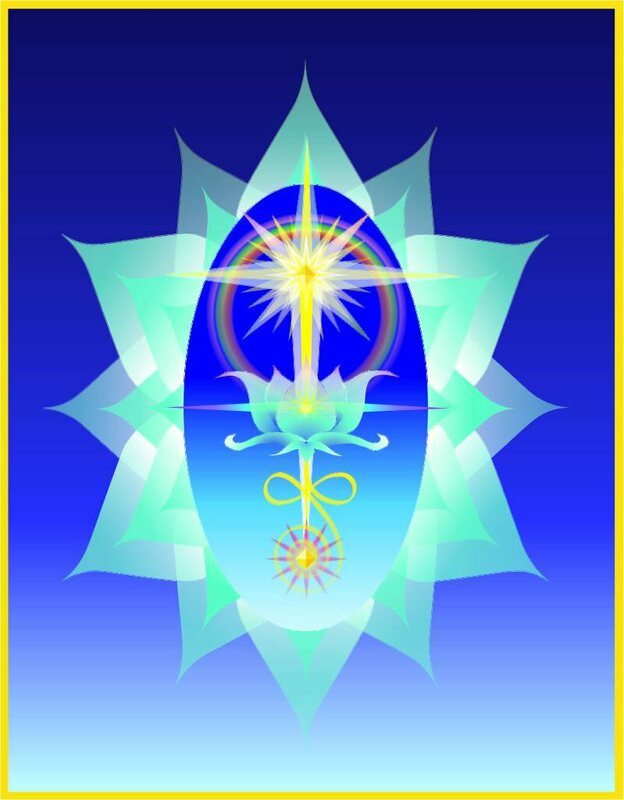 The Sun, the Lotus flower, the Infinity pattern and the Spiral are in the Egg and represent the Heaven (Source of All Love), Crown chakra, the SKHM energy and the Earth (grounding). All these things contribute to establish a light column, a connection from Source to Earth, and in between is Man as a part of the All. It represents man’s connection (channel) to Source that is All Love.